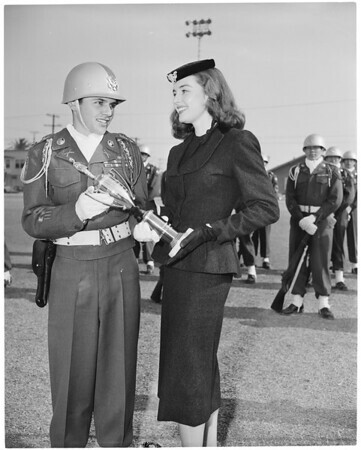 Supplementary material reads: "M-G-M [sic] star Elaine Stewart presents Cadet Colonel Ralph Inzunza of Roosevelt High School R.O.T.C. 'Take the High Ground!' trophy named after her new M-G-M [sic] movie. roosevelt High was this year's winner in the city-wide drill team competition judged by Major Richard L. Kerr, U.S.A., Los Angeles R.O.T.C. Supervisor."